Motorcycle manufacturers demand the best so overwhelmingly choose Yuasa. With over 40 years of development, every Yuasa motorcycle battery provides the same high performance, quality and reliability as your bike’s original. Yuasa motorcycle technology has been developed and improved over time to fulfil the increasing demands of both bike manufacturers and consumers. Originally, dry charge batteries featured a plug lid for maintenance and an open vent to atmosphere. In Yuasa YTX batteries all electrolyte is absorbed in special plates and AGM separators. Advanced lead calcium technology pumps up the starting power and this maintenance free range will last up to three times longer than conventional batteries. 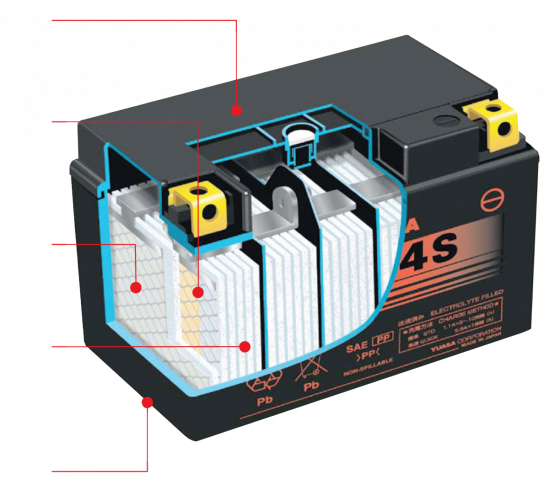 Yuasa YTX batteries are usually supplied “dry charged” with an electrolyte pack, although there are factory activated versions available depending on the model. 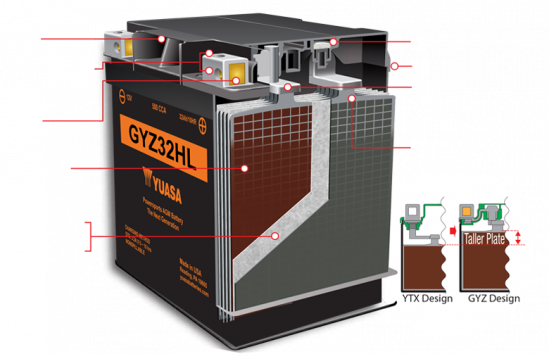 GYZ is Yuasa’s next generation Powersports batteries. Like Yuasa’s YTZ range, they are manufactured following a GS Yuasa unique production process. They are resistant against extreme vibration and have improved charge recovery capability from a deeply discharged condition. Yuasa GYZ batteries have a longer shelf life than any other battery in production and improved life cycle performance. The GYZ series are a perfect upgrade for customized motorcycles requiring the best performance available in the market. They come factory activated and are therefore easy to handle. In 1983 Yuasa introduced dry charge, Valve Regulated Lead Acid (VRLA) sealed maintenance free types. The benefit of these is reduced weight and size, and the elimination of the open vent. From 1999 onwards, the factory activated YTZ wet type, sealed maintenance free, high performance battery was introduced. This removed the need for the commissioning process and allowed angled fitments. Yuasa batteries have a slower self-discharge rate and a longer life which means they out perform other batteries. So the next time you need your bike to start, it’ll be ready when you are.